cap is up to 7 cm broad, convex, smooth, bright yellow, sticky to the touch. older specimens have a planar cap with a depressed center with small radiating furrow-lines at the cap-edges. 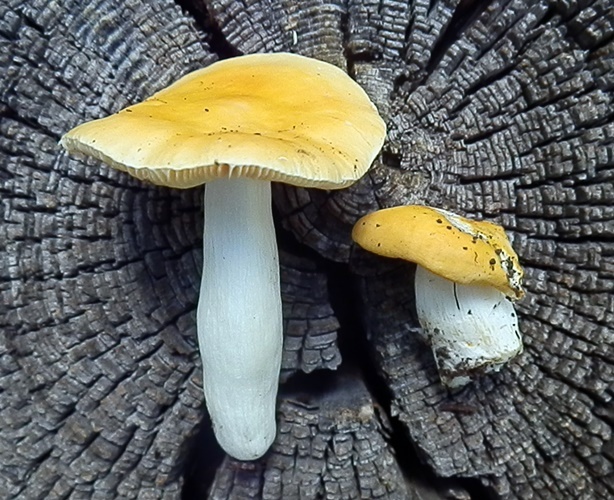 gills are brittle, yellow and narrowly attached to the stem. flesh is white, fragile, does not change color when bruised. stem is smooth, white, non-tapering, not bruising grey. grows in groups or scattered under paper birch and other hardwoods. has a mild taste with an apricot-like odor; cook before eating.